Go Blue for M.E. in 2019! Our fundraisers are busy working up their madcap ideas for how they will Go BLUE in 2019. Why BLUE? Because blue is the internationally accepted and recognised colour of M.E. Awareness. How you GO BLUE is entirely up to you… How far you go BLUE is also entirely up to you. Just do all you can to colour in this cruel invisible illness…. Here are just some ideas..
BLUE faces, BLUE hair, BLUE nails, BLUE themed raffle, BLUE profile photographs on social media, BLUE tongues, BLUE balloons tied to garden gates, Bake sales, plant sales, tea parties, supermarket and shopping centre collections, walks, concerts, orienteering, fun days… of perhaps a virtual BLUE Sunday. For more ideas, see our Events Gallery from 2018. 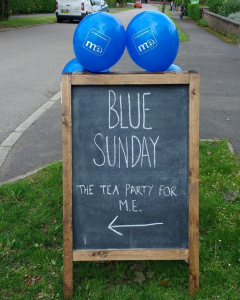 Anna Redshaw launched her Blue Sunday tea parties back in 2013, and they have been going strong ever since. “I invited friends and family to join me for afternoon tea and asked for small donations of the price people would expect to pay for a pot of tea and a slice of cake in a coffee shop. Real People. Real Disease. Real M.E. Making the invisible visible. People with M.E. disappear from society and can easily be forgotten and overlooked. 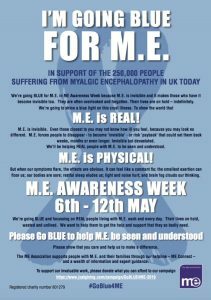 Our mission for ME Awareness Week is to rectify that with our Real M.E. campaign. With your help. Please share REAL stories and images far and wide between 6th and 12th May. 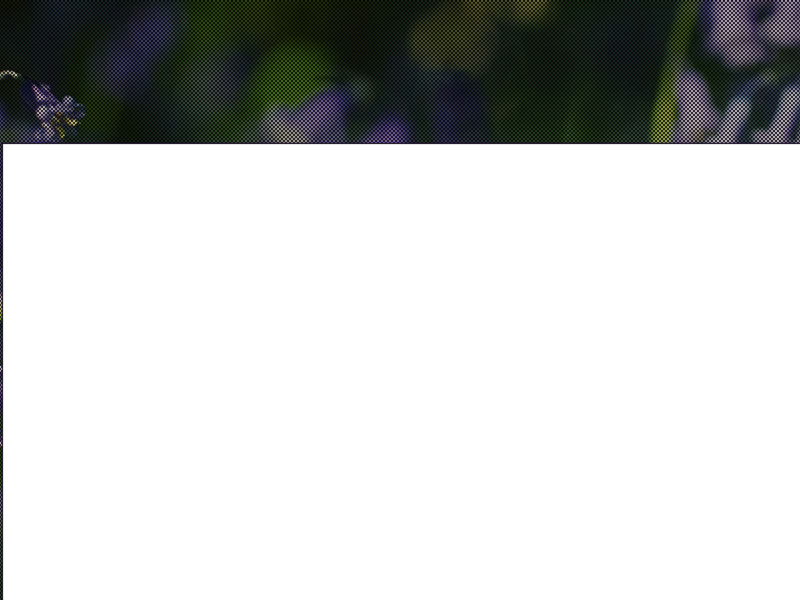 Stories from our website – which we will begin publishing from the 1st May 2019 and will be from REAL people with M.E. 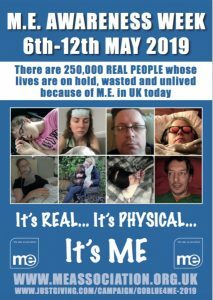 These are stories that are featured in the current edition of ME Essential magazine and many others that we have arranged to be published in news outlets across the UK during the course of ME Awareness Week. Posters (see above – just click the image to download) that you might like to print and display, or share on social media etc. You can request hard-copies from head office (01280 818964 weekdays, between 9.30am and 3.00pm. Email: Head Office.) and we will be publishing more posters from 1st May. 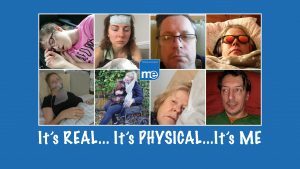 Images from our website gallery – not of models or people pretending to have this cruel disease, but of REAL people who suffer with it every single day. We will be publishing photos with REAL quotes from all those featured in our campaign as info-graphics on the website and social media from 1st May and hope that you will share them across your networks. Share your own image and story, if you feel that you can, and highlight the issues that you feel need to be addressed e.g. research funding, medical education, medical care and support etc. and we will do our best to promote your stories across our networks. Please quote these words in each post you create or story you share: “Real People. Real Disease. Real M.E.” and let’s also reach as many people outside our community as we possible can. Please also share our JustGiving campaign page and encourage others to support our vital work. 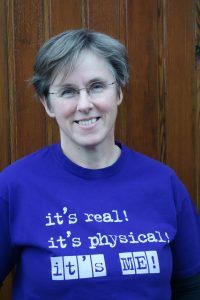 Helen Hyland, our Fundraising Manager, will work with you to help ensure your event is the very best it can be – with ideas, moral support and those essential fundraising supplies for your event. Just download our supplies leaflet, decide what you would like to help support your event, and email over your requirements. Already know what you want to do? 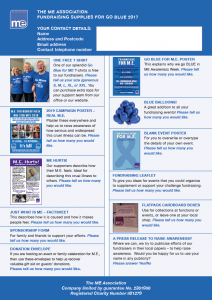 Then make a start by setting up your own fundraising page by visiting our JustGiving Campaign – Go BLUE for ME – 2019.